Daniel Ehrlich has been a leader in Jewish and Zionist education for over thirty years. Today, he guides tour groups all over Israel. Just one day touring with him, and you immediately sense the passion this man has for the Land of Israel and its history. Danny’s mother immigrated to the United States in 1903 originally from Poland and Russia. His father immigrated to the United States from Vienna in 1939. Danny was born in Long Island, New York, one of three boys, two of whom live in Israel today. All three boys were raised with gratitude to the United States for providing refuge for their family. But at the same time they understood that when Jews have the opportunity to come home to Israel, that is where they belong. Danny married Batya and from the beginning, they both knew they would eventually make Israel their home. Batya had grown up in Boston, but her ancestors had settled in Israel in the late 16th and early 17th centuries. One ancestor had been the Chief Rabbi of Tiberius. During a time of harsh famine, her family left Israel in the 1920s for the United States. Today, the Ehrlich children are all grown up. There is 26-year-old Rafi who was an officer in the tank corps and is married to Malka; Ariel, married to Roni, who currently serves in the IDF and has just signed on for an additional five-year term; and daughter Nili who is currently serving in the IDF Education Corps. Nili teaches Russian soldiers who do not have a strong background in Judaism and Jewish history. She is strengthening their Jewish identity so that they have a better understanding of what they are fighting for. Danny’s first encounter with the Christian community dates back to the early eighties. He was invited to join a panel on the topic of “Americans for Israel: How to bring Israel into the home”, and sitting next to him was someone who identified himself as a Christian Zionist, a term he had never heard before. He was fascinated! Danny continued to connect with the Christian Zionist movement, attending the Feast of Tabernacles events in the 1980s and helping to set up antennas in Israel to broadcast Christian radio from Lebanon. Danny met Sondra Oster Baras, Director of Christian Friends of Israeli Communities, in the 1990s while guiding. 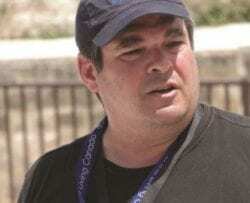 Danny was already living in Efrat, and was asked to become CFOIC Heartland’s Efrat liaison. It was on a speaking tour in the United States where Danny met Margy, President of the US Board of CFOIC Heartland. For years, Danny would guide CFOIC Heartland Feast tours as a volunteer and always was so enthusiastic about the people he met in the group. But then work caught up with him and for years he was not available to guide CFOIC Heartland groups. Danny relished the time spent guiding the group in Judea and Samaria. He took them to see the Cave of the Patriarchs in Hebron, as well as Ancient Shiloh where the Tabernacle stood for 369 years. Integrated into these attractions were fascinating community visits where the group got to personally meet with pioneers of Judea and Samaria. Danny even hosted the group in his own home in the community of Efrat, enabling them to connect in a more personal way with him and his family. He also enjoyed taking the group to Kfar Nahum [Capernaum], where he asked them if they thought it was a Jewish or Christian site. “Just like so many ancient sites in Israel”, he explains, “it is both”. He uses this explanation to show his groups that one cannot understand what it means to be a Christian without fully understanding what it means to be a Jew.